One of the symptoms of the modern malaise, and one of the consequences of the loss of integral wisdom, is the confusion that abounds among people regarding food, diet and nutrition. It is generally recognized that modern, industrial foods no longer nourish man as foods in the past but traditional understandings of the proper sustenance for human beings have, in all but a few parts of the world, disappeared. Modern, industrial foods, processed and prepackaged, are increasingly the norm. It was calculated several years ago that a new McDonald’s restaurant opened somewhere on the Earth every seventeen hours of every day of the year, and the rate is probably faster today. Against this, there is a general hankering for more healthy foods and dietary habits, but this is a response to concerns developed out of the methods and findings of profane science, not out of an acknowledgement of a lost legacy of traditional understandings. Similarly, many people are turning to vegetarianism and more humane diets, but this is out of a squeamish horror for new “factory” methods of meat production, not out of an appreciation of the degree to which modern meat production violates and shuns traditional notions of sacrifice and respect for the slaughtered creature. Many are dabbling with exotic diets and even more are falling into various fads. The scientists one day report that wheat grass cures cancer; the next day that it causes it. More generally, people have lost the traditional contacts with the past communicated through family recipes and food lore and the institution of the common table and, increasingly, even the knowledge and skill to prepare sustaining meals from simple ingredients. This is all a measure of alienation and of modern man’s rupture from the guiding patterns of tradition. In a traditional order the preparation and understanding of food is a cosmological art and science. It is kept within its own proper dimensions and provided with a sacred context by some manner of revelation. 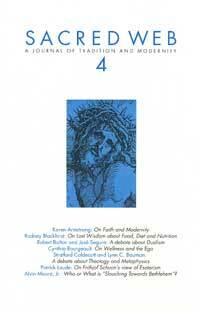 In the Judeo-Christian world the Book of Genesis provides man with the right to enjoy the produce of the earth—though he must labour for it— and both the Jewish and Christian religions derived from the Biblical revelations are subsequently concerned, as a matter of doctrine, with the sanctity of food. In traditional cultures everywhere the preparation and eating of food is heavily ritualized and subject to divine regulation. In the modern order, in contrast, food is simply a matter of utility, fashion and sensual indulgence. The practice of giving thanks to the Creator before a meal persists among marginalized groups of religionists but on the whole modern man gives not a thought to where his food came from and has not an inkling of its relevance to his spiritual as well as physical well-being. The Semitic avoidance of pork seems a silly superstition and the dietary strictures of Lent seem ridiculous inconveniences. More comprehensively, modern man has no idea that there was once in the past, and is still in some corners of the Earth, a science of nutrition derived from a sacred cosmology. The strictures and taboos of religions set boundaries; within those boundaries, in traditional cultures, flourish cosmological arts and sciences based upon a sacred understanding of nature. The modern health food movement is correct to point out the short-comings of modern man’s divorce from nature, but his divorce from the sacred was its prelude. The health food movement is a profane reaction to the obvious inadequacies of the modern diet; it thinks in terms of chemical constituents and vitamins. In the traditional mind “nature” is, more importantly, Creation—foods are evidence of God’s mercy and bounty, and the natural order reflects a sacred design with an exact relation to the human being. Typically, the body of man is seen as a microcosm of the greater cosmos, with both permeated with an identical order that is itself of divine origin. When modern man sees a traditional Chinese meal being prepared he may think no more than “Yum! I love stir-fry!” The health food enthusiast may take stock of the meal’s protein content, minerals and enzymes and feel satisfied, in a sentimental way, that it is full of “natural” ingredients. But a traditional man sees the bowl of the heavens in the smooth, black concave form of the wok, and he sees the grains of rice as stars and the vegetables—parsnips and carrots cut as half-moons or hexagrams—as representatives of the planets. He sees the stirring and agitation of the ingredients as mimicry of the swirling courses of the heavenly bodies and the whole act of cooking as a cosmological process in miniature. It is an act that participates in the processes of a divine and intelligent creation. Traditional approaches to foods place them within a wider cosmological context. In contrast to the approach of profane chemistry with its carbohydrates, anti-oxidants and the like, traditional approaches understand the virtues and vices of particular foods in terms of cosmological categories such as the yin and yang of the Chinese. Some foodstuffs are classified as yin and some as yang and the balance of a diet is determined by avoiding too much of one or the other or by countering foods that are strongly yin with others that are strongly yang. The traditional European equivalent to this was the system of four humors inherited from ancient Greek sources. Some foods were regarded as hot, others as cold, some as dry and others as moist, and their nutritional value was assessed in terms of their action upon corresponding hot, cold, dry and moist humors and organs of the body. The scientistic mind dismisses these systems as fumbling attempts to uncover the secret order of nature revealed at last by the chemists and geneticists. In fact, these systems were aspects of a profound sacred science transmitting the wisdom of an ancient contemplation of nature rooted in metaphysical principles. Something of the four humor system still exists in the Muslim world where foods are described as either hot (garmi) or cold (sardi), with four possible degrees of each, with foods acting upon either the blood, the phlegm, the bile or the black bile of the body. The classifications are not made on the basis of crude chemical analysis but refer rather to essences (akhlat). The heat and the cold are not measures of calories or energy with which the modern physical sciences are concerned but are cosmic polarities inherent in all things of creation. Sometimes the shape, colour, habit of growth or other factors are crucial in determining the value of the food. Thus, for instance, plump, short-grained rice tends to be a hot (garmi) food, but the longer grained varieties are cooler. Sometimes these determinations arise directly from the recommendations of the Traditions of the Prophet Muhammad, many collections of which are particularly rich in food-lore. In one hadith, the Prophet is reported as having said, “The main cause of disease is eating one meal on top of another.” Apart from the obvious good sense of this saying, the Muslim tradition has taken these words to refer to the mysteries of digestion which depend upon the hot and cold essences. In particular, there must be an appropriate amount of heat for the body to accomplish all of the transformations of digestion; otherwise the body grows cold and the transformations cease. Modern processed foods and the mainstays of the modern Western diet—refined sugar, refined flour, beef, dairy products, potato starch—are cold foods; typically the modern Western diet yields only enough heat (garmi) to accomplish the crudest physical transformations while the more subtle but vital qualities of the food remains undigested and pass through the body. Consequently, people living on such a diet seek out stimulants and turn to modern medicines which are all hot (garmi) in their effect. Eastern traditions such as Ayruvedic or Taoist medicine make the same analysis in terms of their own categories. The Muslim tradition finds its authority in the Islamic revelation, and uses terminology and concepts that are meaningful within Islamic civilization, but the principles are universal. Garmi and sardi are essentially the same principles as yin and yang, and the Eastern traditions too understand nutrition as an alchemy of digestion requiring a balance of these universal forces. One of the characteristics of traditional methods of cooking is the tendency to employ a small measure of heat for long periods of time. This is particularly the case with grains which were often simmered for days before being consumed. This was not only to soften the grain—a shorter period of cooking would achieve that—but also to make it more digestible and sustaining and to effect profound changes in the substance of the grain. The modern, scientific approach to these matters reports the loss of vitamins and chemical nutrients in long cooking and recommends raw or lightly cooked foods. The pace of modern life also tends to promote quick and simple meals, zipped open and popped into a microwave oven. But in China, India, Japan, the Middle East and in medieval Europe meals were often cooked for long, not short, periods and special qualities were said to have been imparted to foods prepared in these ways. Time was considered an essential factor in nutrition. This is still recognized in the case of foods like cheese and wine, which mature over time, but it is no longer recognized as important to the preparation of grain and vegetable foods. Traditional methods, found throughout the world, typically take a whole grain such as wheat berries, cover in water or broth, add a little salt, and seal in a heavy pot cooked over a very low heat overnight or for several days. Other ingredients may be added at particular stages of the cooking. Jewish cuisine knows several dishes cooked for seven days, including the proverbial Chicken Soup where a whole bird, head to feet, is boiled slowly for seven days until it is reduced to a gelatinous liquid. This is indeed a type of domestic alchemy. It recalls the long, slow cooking methods employed in the transmutations of the alchemist. This is the dimension of which modern science knows nothing. Traditional long cooking methods seek to transmute food, not just warm it through. A similar intention lies behind the Chinese practice of pickling eggs for extraordinary lengths of time, sometimes hundreds of years. The egg is not just pickled, but transformed into a new substance. These methods of food preparation are calculated to manipulate garmi or sardi, yin or yang, and to transform the essence of foodstuffs, not only their crude constituents. The diets of so-called primitive peoples, hunter/gatherers, is characterized by diversity. Neolithic remains preserved in peat-bogs reveal that people then ate a fantastic array of seeds, roots, tubers, grubs, insects, flowers and herbs, as well as fish and meat, all in small quantities. No foodstuff predominated. The advent of civilizations, however, brought the domestication of cereal grains which were used as staples. The diversity of the primitive diet became the array of accompaniments— sauces, dips, salads—to the bed of grain, rice, wheat, barley or maize, that formed the foundation of the meal. The inherent balance of the diverse primitive diet was maintained by devising methods of concentrating and enhancing foods. (The Jewish Chicken Soup, for instance, distills a foraging bird with a naturally diverse diet down to its essence.) Typically, meat consumption was irregular and connected with religious observances; a legume accompanied the grain as a staple source of protein. Rice and the soybean were the nutritional foundations of Chinese civilization, like wheat and the chick pea in the Middle East and rice and dhal or lentils in India. The modern, industrial Western diet, however, deviates from this norm significantly. Meat—devoid of all religious associations and prepared without responsibility to the creature or its Creator— has become the focus of the meal, accompanied by a narrow selection of vegetables and, very often, no grains whatsoever. The side dishes have become the main event. The “balanced” meal described by modern nutrition experts is balanced in terms of crude chemistry but not in terms of the equilibrium crafted by the grain-based diets of the great, traditional civilizations. Nothing illustrates the decline of the Western diet from traditional norms more dramatically than the recent history of bread. The white, fluffy stuff found on modern tables, alleged to be “bread”, bears no resemblance to what was known as bread in traditional times, the “staff of life”. Modern bread is a highly processed product that, if it contains any goodness at all, has had it added in the form of synthetic vitamins and reconstitutions of the very substances destroyed during processing. The history of the decline of bread, however, has largely to do with rising agents and leavens. Traditional breads were either sourdough risen or unleavened. They were heavy and chewy and nutty in flavour and deeply sustaining. In the 19th century, German chemists isolated strains of active yeasts and the era of industrial bread, produced with a uniform rising agent, began. The sourdough was a very local foodstuff. A batter is exposed to the air and to whatever yeasts are in the region and allowed to turn sour. This is then folded into the dough and left to rise after kneading. In this way people developed a very specific acquaintance with the microflora of their district, as the scientists would explain it. Industrial or ‘German’ yeasts were produced in laboratories under controlled conditions; the yeasts were pure monocultures and allowed a uniform end-product that was lighter than any bread made from the comparatively haphazard sourdough method. Further refining of the flour allowed an even lighter bread until it became more of a confection than a bread in any proper sense. Very soon, the taste and texture of traditional breads was forgotten altogether. In more recent times this process has gone even further so that now chemical rising agents have replaced the German yeasts, ostensibly because they do the same job more cheaply and more quickly and because, increasingly, people are intolerant to the industrial strains of yeast. The sacred status of and the mysteries associated with bread in various traditions need not be recounted in detail here. We need only point out what an extraordinary spectacle it is that the decline of bread sketched above could have occurred in a civilization that in ancient times knew the cult of Demeter and the mysteries of Eleusis and, for the last 2000 years, has had the Christian Eucharist, a meal of bread, as its central and most solemn ritual. A number of other things also deserve to be mentioned as symptomatic of the way dietary changes in the modern West parallel its deviation from tradition in general. Modernity is thirsty; both metaphorically, for a wisdom it no longer even suspects exists, and literally for a diet awash with drinks. Other than the proliferation of McDonald’s restaurants, the global reach of Coca Cola promotion is another emblem of the spread of non-traditional, industrial foods. Traditional diets include far fewer liquids than the typical modern, Western diet. This is largely because traditional diets are grain based and a large portion of the necessary daily liquids is consumed through the liquid absorbed through boiled or steamed grains. There are far fewer liquids and far more salts in meat, however, so the modern meat-based diet requires supplementary liquids, usually in the form of sugared drinks and soda waters or plentiful cups of tea and coffee. In traditional cultures, such as that of Japan, drinks come in small cups and are infrequent. The notion that drinking large quantities of liquid is a healthy practice is non-traditional. Traditional understandings think of the human digestive system, as indicated above, as like the athenor of the alchemist; popular opinion in the modern West holds it to be a type of drainage system that needs to be flushed out regularly. The subtle transmutations achieved by traditional cooking methods are designed to duplicate and advance the processes of human digestion. (In many languages the same word is used for cooking and to describe the processes of digestion.) Many traditional foods, such as soybean foods like the Japanese miso, or dairy foods such as yoghurt, or brassica foods such as sauerkraut, are predigested ferments specially adapted by traditional methods for human digestion. Their benefits, and all but the crudest processes of digestion, are lost in a diet with a high liquid intake. Alcoholic beverages, wine and beer, were once foods, means of preserving juice and grains, again by means of live yeasts and fermentation. Their decline and denaturing is evident from the fact that these drinks today require artificial preservatives to keep them, a task originally and properly belonging to the alcohol itself. Related to the high liquid intake of the modern diet is a profoundly disturbed relationship between man and his most intimate contact with the mineral realm, salt. Salt is the traditional, universal condiment of mankind, essential for his survival and for his enjoyment of flavour, yet in modern nutritional reckonings it is problematical and associated with various modern diseases. This has to do, again, with the refining of the modern table salt and its corruption with free-flowing agents and, again, preservatives (as if salt, like alcohol, was not a preservative itself), and to do with the high consumption of meat and animal-grade salts in the modern diet. Traditional cultures understand better the proper, even sacred, role of salt in the life of man and use it appropriately as a catalyst to enhance the flavour of food rather than to mask its tastelessness, which is the role of salt in industrial, processed foods. Salt is a bond of human community. When Semitic food restrictions forbid the drinking of blood they are, just as much, insisting upon a social order that ensures the proper distribution of mineral or sea salt. According to the hadith, the Prophet Muhammad began and finished every meal with a pinch of salt and praised it as a blessed thing. It is a symbol of purity and wisdom. Without the catalyst of salt the transmutations of traditional cooking methods are without effect. Interest in Eastern spirituality among dissatisfied Westerners is often accompanied by the discovery of a different and more traditional type of cuisine. This is a very immediate way in which they can experience something of the traditional order for which they long. The traditional culinary wisdom of the Chinese and Japanese no longer prevails in China and Japan, but it is far more intact than traditional ways in the West. With the necessary adjustments it is still possible to reconstruct many traditional methods and recipes from their current corruptions. This is also true of Middle Eastern cuisine. It has been corrupted with cane sugar (a cold—sardi—form of sweetness, sweeteners normally being hot foods), with stimulants (coffee), nightshades (tomatoes, aubergines) and, as in Islamic culture generally, affluent urban living has led to the over-consumption of meat, but it is still possible to discern the outlines of the traditional diet, based on cereal grains (cous cous, burghul) and legumes (fava beans, chick peas). In rural areas it is still possible to find people cooking rich, grain-based stews using long, slow traditional cooking methods. These are the same areas where traditional craftsmen can still be found crafting their wares and where sacred patterns, derived from revelation, inform every aspect of life. They will tell you in these parts that the fast of Ramadan is not only to remind the faithful of what it is like to be hungry—a sociological and sentimental explanation—but that it has mysterious effects upon the liver and the humors, and they will recommend traditional Ramadan dishes that cleanse the organs of the body and bring visions to the soul. There can be no doubt that modernity brings with it a diet that is not only a product of profane understandings but that makes men profane beings, insensitive to the spiritual and isolated from the living forces of the cosmos. There is more at stake in the foods we eat than refilling our inner test-tubes on a regular basis or of avoiding carcinogens and other hazards, and there is more to food in a sacred culture than simply saying “Grace” with meals. Industrial foods are fodder for automatons, soulless food for the soulless. This is not just a matter of health, but of a relation to the macrocosm, our place as creatures in creation. Storl W.: Culture & Horticulture, Biodyanamic Literature, Wyoming, 1979. Visser M.: Much Depends Upon Dinner, Penguin, London, 1986.